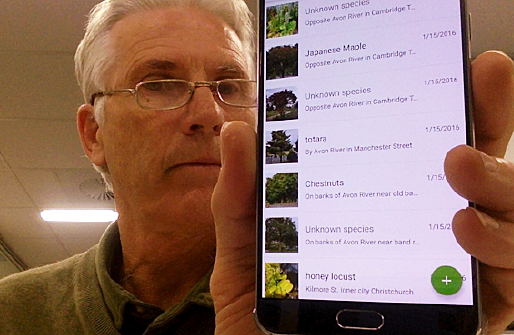 iNaturalistNZ on my smart phone. Note the + sign to add a new observation. Why does iNaturalistNZ appeal to me? It is part of human nature to be curious and to belong to groups. Belonging gives opportunities to contribute, be affirmed, and gain personally from the experience. iNaturalistNZ enables your curiosity to be translated into valid scientific contributions without being a scientist; it removes barriers and gives you the chance to be a citizen scientist. Anyone with minimal camera skills and IT capabilities can make a worthwhile contribution. How good is that! I can also see the potential for getting my family more informed about the living world. For example, the next time my daughters freak out because they see a spider, I am going to photograph it first and put it on iNaturalistNZ and see where that leads. 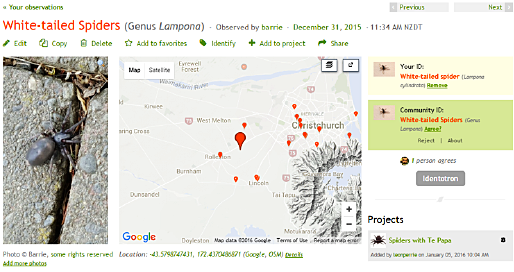 Lastly, with my professional educator hat on, I see unlimited potential with iNaturalistNZ! 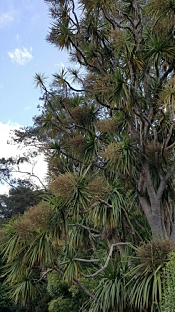 My observations include this fine example of Cordyline Australis, also known as tī kōuka or the New Zealand Cabbage tree. Once I had downloaded and installed the free app, I chose a tree for my first observation – they are easy to photograph because they are big and don’t run or fly away! The date and time was automatically recorded, and with GPS turned on, I did not have to enter the location. I moved the slider to “Needs ID” and clicked Save. If you are out of cellphone range, or do not want to use up valuable data on your mobile plan, wait till you get to a WiFi network before clicking Sync, which will upload the data and photos. This first part took me about 15 minutes. Later, when I logged into my iNaturalistNZ account via my laptop and looked at My Observations, I saw that my tree had been identified by people in the iNaturalistNZ community. Heartened, I used the app to photograph and record more tree observations. In my early “clumsy” stage of learning, I didn’t notice that you could click on the camera icon to take more photos of the same tree, so I was only taking one photo of each tree, showing the whole thing. I have since learned that it’s good practice to take a photo of the tree that also shows its habitat, then one of just the whole tree, and then at least one close-up photo of a leaf, or bud, or flower. Why? Some trees are tricky to identify! This brings us to the concept of Projects in iNaturalistNZ. There are hundreds of them, ranging from wetland restoration projects to recording the biodiversity in school grounds. Most projects have a defined geographical area, and all observations added to it become part of a dataset that can be analysed by anyone. Projects are great, and a huge component of iNaturalistNZ, but I would hate for anyone to delay starting with iNaturalistNZ because they don’t have their own project, or can’t find one to contribute to. “Are native species spreading back into areas they once were?”. It’s also great that I am getting help identifying my plants and learning at the same time. 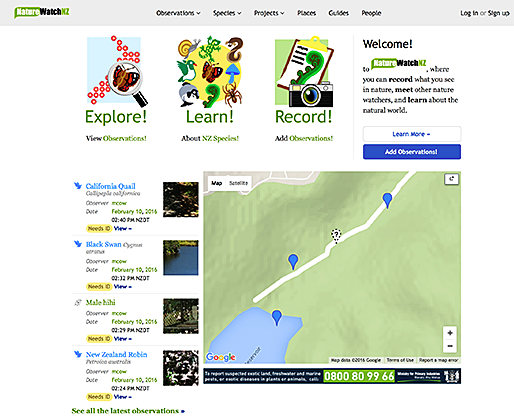 Are you keen to try iNaturalistNZ now? How about putting a reminder on your digital calendar so that when you go home today, you download the app, then go outside with whoever else is at home, choose one living thing to photograph (please, NOT your pet!) and record and save your first observation. Later, use your laptop to log in and see if anyone has identified the item in your observation. And have a click around — there is a huge amount more “under the hood”. That will also get you ready for what I have to say in my next post on this subject. In part 2 of this blog series I will unpack the pedagogical reasons for using iNaturalistNZ with teaching and learning programmes in New Zealand schools. I will look in more depth at the links between iNaturalistNZ and 21st Century learning trends, how iNaturalistNZ integrates with Learning Areas, especially Science, and write more about what you can expect with iNaturalistNZ on the LEARNZ Wetland Biodiversity virtual field trip. Barrie Matthews works with teachers across the sectors and curriculum areas to get the best out of LEARNZ and ICT. Barrie brings a wealth of experience to his role as LEARNZ Project Manager, he was a classroom teacher for 15 years, and has 30 years of computing and ICT experience. He has a BSc, a Diploma in Internet Technology, and a post-graduate Diploma in Sport Coaching. He has worked on the LEARNZ project for the past 10 years helping to grow the programme, which is now running in 90% of New Zealand schools.